World rally champion Sebastien Loeb will not be able to race in Formula 1's final grand prix of 2009 after being denied a mandatory super licence. Loeb, 35, was hoping to drive for Toro Rosso in Abu Dhabi on 1 November but governing body the FIA deemed that he did not fulfil the necessary criteria. "My only regret is that it would have been fun to do it," said Loeb. The Frenchman also said he feels it is now unlikely that he will ever have the chance to race in F1 again. 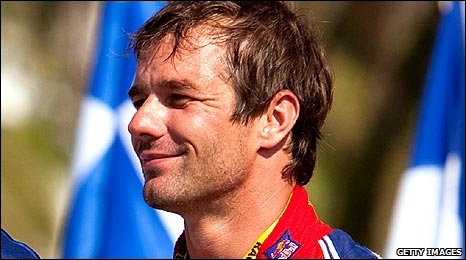 "I told myself that I will probably only have one opportunity like this in my life," Loeb told his official website. "I did not get the super licence this time, [and] I do not see how I could get it without preparation and the necessary tests in F1. "Finding an opportunity like that again seems very unlikely. All this put together, I do not think this opportunity will present itself again." Citroen driver Loeb will chase a sixth world rally title in the season's final event this weekend, the Rally of Britain. He will start one point behind Ford driver and championship leader Mikko Hirvonen of Finland. "Now I will focus only on Rally Great Britain with my sights set on the world title," he said. "It is just as exciting or more exciting than an F1 grand prix." Loeb has tested an F1 car before and, despite seemingly giving up on appearing in an actual grand prix, he admitted he would be keen to do so again. "If my boss lets me go, yes," he added. "It's always a pleasure to drive an F1 car. If I have another opportunity to get back into a single-seater car, I will not pass it up."